Sometimes in business its really hard to see the wood for the trees, you get on with the day today running of your work schedule without being able to take a look at the big picture. Recently I was asked what my Unique Selling Point for Ardnet was, and it took sometime to think about it. A business associate finally came up with the answer. At Ardnet we maintain and manage our customers sites for a flat rate annual fee, we want to establish a long and happy relationship with our customers and not just create a website and disappear. We have been in business now almost 11 years and are definately here to stay. Remember all our prices are not VAT FREE! Content management allows customers to make regular changes to their website including adding new pages and uploading photographs, keeping a news blog and even adding events information or a photo gallery. We are now offering bespoke designed content management systems to allow you to modify your website inhouse with the minimum of fuss, this service is still backed up with our maintenance and support service guarantee. Established in 1977 Beattie Crane Hire have been providing all types of cranes to the construction and industrial sectors for over four decades. 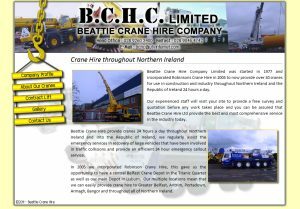 Beattie are the only provider in Northern Ireland of a small domestic use 10 ton crane but can provide over 30 different cranes including a huge 180 ton crane. 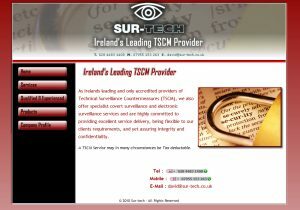 Irelands leading and only accredited providers of Technical Surveillance Countermeasures (TSCM) and covert surveillance and electronic surveillance servies. The website includes information on the various services offered by the company. 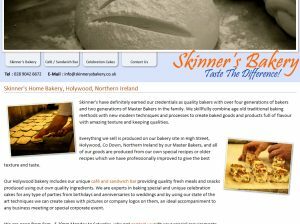 Four generations of bakers and two generations of master bakers make up the huge knowledge base of this bakery in Holywood, Co Down, mixing the latest photographic cake technology with traditional bakery methods. Find out about the amazing picture perfect celebration cakes where photographs can be printed onto cakes.